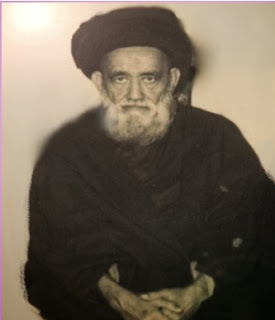 Hujjatul islam Marhoom Syed Ali Naqi saheb. Syed Ali Naqi Naqvi (born 1905 - 1988), also known as Naqqan, was a mujtahid from Lucknow, India who graduated from Najaf, Iraq. He is famous for his writings in Urdu, including the books Shaheed-e-Insaniyat and Tareekh-e-Islam. He was one of the most highly regarded scholars of Shia Islam at his time. His first journey to Iraq with his family was in 1327 Hijri. His ‘Bismillah’ at the age of seven in Rauza-e-Imam Ali in Najaf, Iraq. He received his initial religious training by Aaqae Syed Mohammad Ali Shah Abdul Azeemi. After his father, Syed Abul Hasan, received his ijtihad, the family moved back to Lucknow when Syed Ali Naqi Naqvi was aged 9. He taught Arabic and Persian at Lucknow University, Lucknow, India. Later he joined the Aligarh Muslim University in the Department of Shia Theology where he was its Chairman and was also on numerous occasions the Dean of the Faculty of Theology. He taught both the undergraduate students as well as post-graduate students. He was respected by all at the University. His first book published in Arabic was in Najaf during his days as a student and was the first ever book to be written against Wahabis, it is called “Kashf annaqab ann aqaaed Abdul Wahab Najdi”. His second book in Arabic was in defence of the act of “Matam, by the name of “Aqalatalaashir fi eqamatalshaaer”. Message Of Peace: Hujjatul islam Marhoom Syed Ali Naqi saheb.